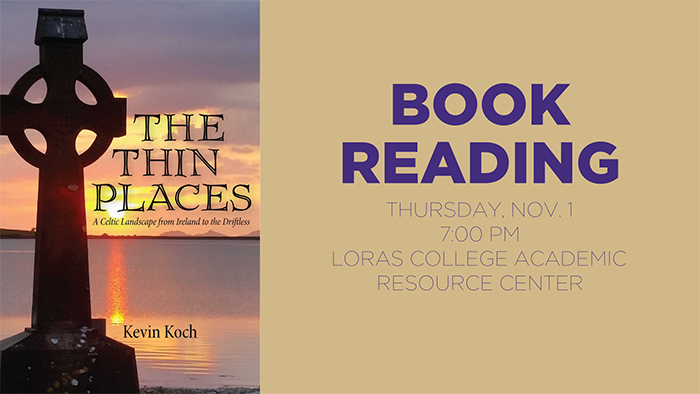 DUBUQUE, Iowa – Kevin Koch, faculty department chair and tenured English professor at Loras College, will present his newest literary publication “The Thin Places” on Thursday, Nov. 1 at 7 p.m. in the Academic Resource Center. Copies of Koch’s latest book will be available for purchase. 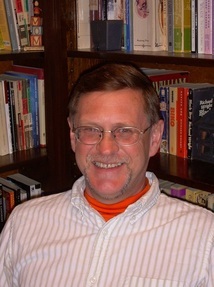 For Koch, “The Thin Places: A Celtic Landscape” is the fourth book he has authored, following in the footsteps of “The Driftless Land: Spirit of Places in the Upper Mississippi Valley” (2010), “Skiing at Midnight: A Midnight Journal from Dubuque County, Iowa” (2002) and “Rising with Christ: Catholic Women’s Voices from Across the World” (1994). The book connects places in Ireland with places in the American Midwest’s Driftless Area along themes of Celtic Spirituality organized around the eight feast days of the Celtic Wheel of the Year. The term ‘driftless area’ refers to the hilly, rocky terrain of the Upper Mississippi Valley and southwest/central Wisconsin that was bypassed by the glaciers that leveled much of the Midwest, hence it has little to no glacial ‘drift’. In 2012, Koch was the Faculty Study Abroad Director for Ireland, spending four months on the “Emerald Isle”. He later returned in 2016 for two months to compile research for “The Thin Places”. He spent a majority of his time in Westport, conducting interviews and connecting with mountaineers, geologists, conservationists and spiritual leaders for guided hikes in the mountains and bogs. Koch’s courses at Loras includes ‘Nature Writing’, ‘Writing the Midwest Landscape’, ‘Writing the Mississippi Nonfiction, ‘Monastery Voices’ and ‘The Nature of Nature in Ireland’.